In 1997, Elizabeth Shown Mills' Evidence! Citation and Analysis for the Family Historian set a new standard for citing genealogical sources. Reprinted in 2006, this 124 page hardcover book still provides the family history researcher with a reliable standard for the sound analysis of evidence. While not quite as heavy as her new 885 page Evidence Explained: Citing History Sources from Artifacts to Cyberspace, if you still want the principles for correctly evaluating and understanding sources and evidence, you can't go wrong with this book. For a limited time, we are offering Evidence! Citation and Analysis for the Family Historian for just $10! USA | Pennsylvania | Philadelphia - September 3-6, 2008. Federation of Genealogical Societies Conference. Please visit us in booths 610 and 612. We will be demonstrating Legacy 7.0. Bring your questions and suggestions! USA | California | Sacramento - September 8, 2008. 6-week course on Legacy is offered at the Mission Oaks Community Center beginning September 8, 2008. Held at 4701 Gibbons Drive in Sacramento. (916) 972-0336. It will meet 10:15-12:15. If interested contact Mission Oaks Center to register. Enrollment is limited to 25. The class will cover the basic features of the program, and introduce those new to Legacy 7. Basic computer knowledge is required. USA | Arizona | Scottsdale - September 16, 2008. Family History Society of Arizona, Paradise Valley Chapter. Legacy's Geoff Rasmussen will present "Organizing, Planning, and Sharing with Legacy Family Tree." Held at the Senior Center at Via Linda, 10440 N. Via Linda, Room 6 in Scottsdale. The Legacy part of the meeting will begin at 7:00. For more information, contact Jan Motley. Canada | Ontario | Ottawa - September 19, 2008. British Isles Family History Society of Greater Ottawa conference. Genealogists in or near Ottawa, Ontario have a tremendous opportunity to learn the ins and outs of Legacy Family Tree 7.0. 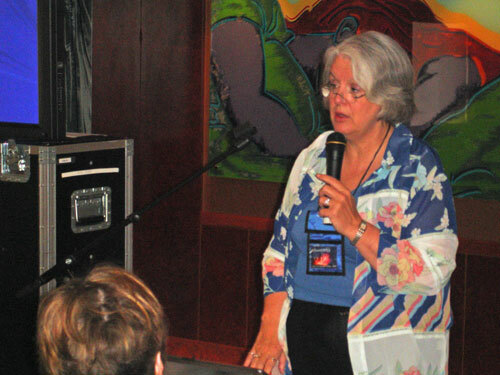 On Friday, September 19, 2008 Global Genealogy's Rick Roberts will present an all-day workshop on Legacy 7, with instruction designed for all levels of expertise. The workshop, held at Library and Archives Canada, is part of the 14th annual British Isles Family History Society of Greater Ottawa conference. 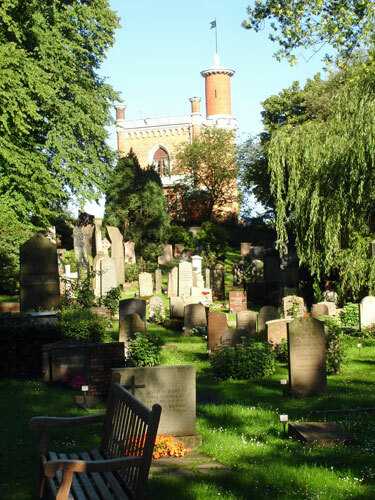 · Mapping your Ancestors Electronically. USA | Washington | Bellevue - October 11, 2008. Eight Annual West Coast Summit on African-American Genealogy, "Family History - Putting the Pieces Together" will feature Quintard Taylor. For more information telephone 206-784-0337 or 206-927-5039 or check the website at http://www.blackpast.org or email BGRG92@aol.com. Please note there is no walk-in registration for this event. 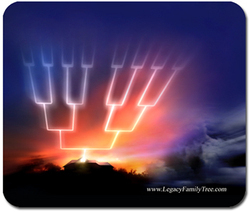 Jim Terry of Millennia Corporation will conduct classes on Legacy Family Tree. Held at the Bellevue South Stake Center, 15205 SE 28th, Bellevue, WA, USA. USA | California | Seaside - October 11, 2008. Heritage Harvest Central Coast Genealogy Conference. Sponsored by Monterey County Genealogy Society, Inc. and Monterey/Seaside Family History Center. Held at 1024 Noche Buena St. (Noche Buena & Plumas), Seaside CA, 8:30 a.m. to 4:30 p.m. Check-in at 8:00 a.m.
Also classes with local instructors on Beginning Research, DNA, Ethnic and U.S. Regional Research, Online Research, computer training and more! Pre-registration by Sept. 25, 2008 will guarantee syllabus and lunch. USA | Texas | Dallas - October 14, 2008. Legacy Family Tree Part III, a 4 session course is offered at Brookhaven College, October 14-23, 2008, on Tuesday and Thursday afternoons from 1-4:20 p.m, in Room M124. This course will cover using the U.S. County Verifier, GeoDatabase, Mapping, Picture Center and, how to prepare To Do and Chronology reports to aid in your research. To enroll call Brookhaven College (972-860-4698). Canada | British Columbia | Surrey - October 18, 2008. 12th Annual Tri-Stake Seminar "Finding Your Roots." Jim Terry of Millennia Corporation will conduct classes on Legacy Family Tree. For information please contact Sally Haysom at shaysom@gmail.com or by phone at (604) 644-9934 or (604) 501-0188. Held at the Surrey Stake Centre at 6270 - 126th Street in Surrey. USA | Texas | Dallas - October 28, 2008. Legacy Family Tree Part IV, a 4 session workshop is offered at Brookhaven College, October 28-November 6, 2008, on Tuesday and Thursday afternoons from 1 – 4:20 p.m. in Room M124. Students will bring their Family File to the workshop and receive help in entering individuals, events and sources. 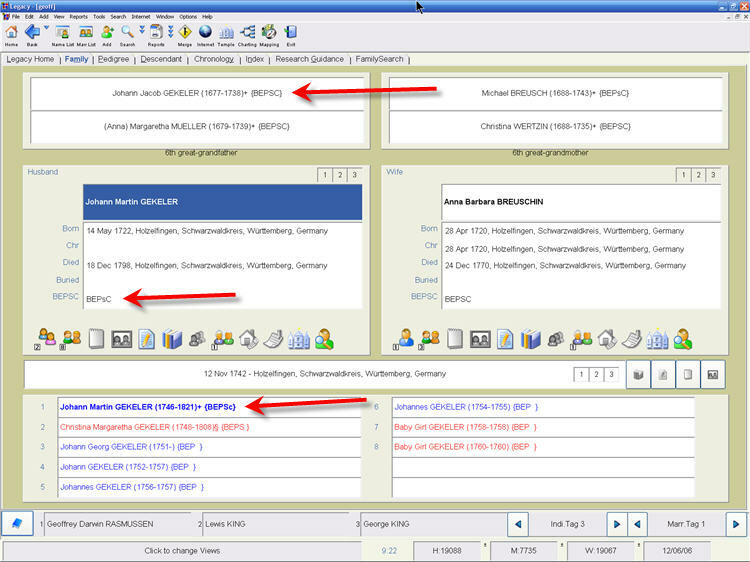 Tips, tricks and techniques using Legacy, the new functions in Version 7, complex searches and customized reports will be discussed. To enroll call Brookhaven College (972-860-4698). USA | Arizona | Youngtown - October 29. West Valley Genealogical Society begins a 4-week course on Technology Aids for Genealogy, taught by Legacy's Geoff Rasmussen. Each session is two hours long and includes detailed handouts. Registration is required. Seating is limited to 25. Call 623-933-4945 for more information. USA | Arizona | Prescott - November 1, 2008. Northern Arizona Genealogy Society will feature a free Genealogy/Family History Seminar featuring Legacy Family Tree's Geoff Rasmussen. Held at the Prescott Public Library, Founders Room, First Floor at 215 E. Goodwin in Prescott. Seating is limited to the first 100 registrants, so please register in advance. All pre-registered attendees will be given seating preference. Visit http://www.rootsweb.ancestry.com/~aznags/Seminar08.htm or contact rjunkins@cableone.net for more information. USA | Utah | Provo - November 7, 2008. International Commission for the Accreditation of Professional Genealogists (ICAPGen) annual seminar will feature Legacy's Geoff Rasmussen speaking on "Legacy Family Tree Genealogy Software for the Professional." For more information, visit www.icapgen.org. USA | Arizona | Fountain Hills - November 10, 2008. Family History Society of Arizona, Fountain Hills Chapter. Come learn about Legacy Family Tree, taught by Millennia's Geoff Rasmussen. The Legacy presentation begins at 10:00am and is held at the Fountain Hills Community Center at 13001 N. La Montana Drive. For more information, click here. Visit http://www.myancestorsfound.com/events/upcoming.php?event_id=43 for more information. Thanks to John Reid, author of the Anglo-Celtic Connections blog, for alerting us to the new availability of the 1916 census of the prairie provinces (Manitoba, Saskatchewan, and Alberta) of Canada. The census is currently only available on microfilm at Library and Archives Canada on microfilm reels T-21925 to T-21956. Digitization and indexing are being undertaken as part of an agreement with The Generations Network. I'm particularly interested in this new census because my wife's family and ancestors are from Canada. I've been trying to identify when her family came from England to Canada. First, I ordered a copy of the 1940 National Registration for Jane Hague with the hopes that in the Immigration Year box I would learn when she came. Unfortunately, instead of a year, the phrase "N.G." was listed. If anyone knows what this stands for, I'd love to hear from you! It's always so exciting when a major new resource like this becomes available. Congratulations western Canada! Surprise, Arizona, August 18, 2008 -- Millennia Corporation, a leader in family history software, today announced that its software, Legacy Family Tree, is now available in two new languages: Deutsch (German) and Svenska (Swedish). The software, used by beginners and professionals to record, plan, and share their family trees, is now the premier choice for German and Swedish researchers. Legacy is also available in Danish, Dutch, Norwegian, and English editions. "Making genealogy software available to researchers in their native language is a big step in helping the world trace their family trees," said Dave Berdan, president of Millennia Corporation. "This is an exciting day for us to help German and Swedish researchers." Translation is in progress for the following languages: Afrikaans, Chinese, Eesti (Estonian), Español (Spanish), Français (French), Italiano (Italian), Português (Brasil), Português (Portugal), and Suomi (Finnish). Legacy Family Tree 7.0 just got a little more exciting for me! I just learned about a new option that I had never known before. I'd like to think this new option was recently added, but it's probably been there for years. 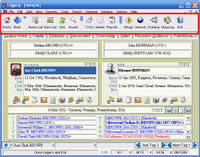 In a previous article, we explained how to customize the main toolbar. 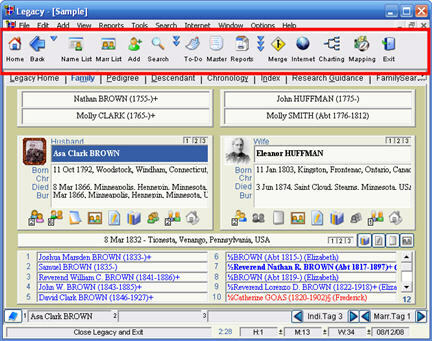 Located near the top of the Legacy screen, the main toolbar contains buttons for commonly-used features. 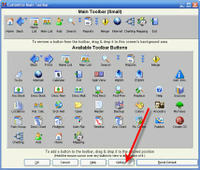 If you right-click on any of the buttons you are then able to choose from over 40 additional buttons. 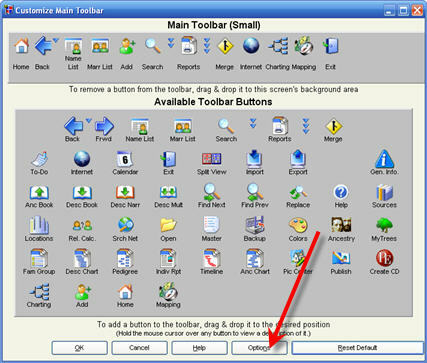 Today I clicked on the Options button at the bottom of this Customize Main Toolbar screen (see image below), where I could then choose the size of the buttons: small, medium, or large. After choosing the small option, I closed the screen, and now in my main Legacy screen, I still had all of the buttons at the top, but now they didn't take up quite as much room. Is this a new feature to anyone else, or just me? 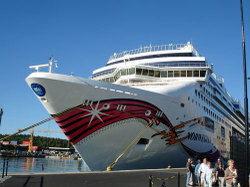 Just before we left on our Legacy Genealogy Cruise, we issued an update for Legacy. After recovering from the great time we had, we're now able to write a little about what's new in this update. New! Two new filtering options have been added to the Master Source List (see highlighted area in image, click on image to enlarge). The Master Source List is accessed at View > Master Lists > Source. If you click on the "SourceWriter" option, the entire list is filtered to only show those sources that were created using Legacy 7's new SourceWriter. If you click on the "Basic Style" option, the list shows you only those master sources that have not yet been converted to the new SourceWriter format. This makes it easy to know which sources to work on if you want to convert them to the new style. By the way, the SourceWriter-style sources have a small bullet at the beginning of the name. Basic-style sources do not. This update does not yet introduce the "official" Source Conversion tool. In the meantime, I've been manually converting some of my existing sources to the cool new SourceWriter format. A little over a month ago I published a message to our Legacy User Group outlining the specific steps I've been using. If you are interested, click here for the archived message. New! Switching between adding a Basic Style source and a SourceWriter style source is much easier now. You used to have to go to Options > Customize > Sources tab > Source Entry System to turn on or off the SourceWriter. Now, when the SourceWriter is enabled, when you click on the Add a New Source button for someone, the "Add a New Master Source" screen appears - as usual. Now, the first choice in the list of source types is Add a Basic Style Source. Click on it, and you can then proceed as normal adding a new master source. If the next time you want to add a SourceWriter style source, just click on the desired source type. New! Scotland now has its own SourceWriter census templates. These templates, which cover the years 1841-1901, have all the right fields to fill in--specific to Scotland census records. 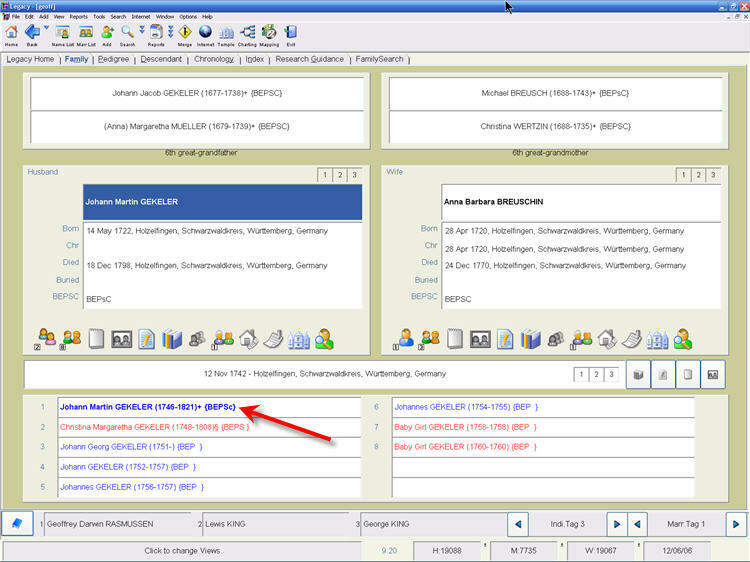 There are now different templates for Basic Style, Microfilm, Microfilm (filmed by Family History Library), Online Database, and Online Images. No more wondering what fields to use to enter information. All of the Canadian census templates will come in the next update! There were a few other minor improvements and fixes with the SourceWriter and reports. We also fixed the Error 9 when printing from the Name List / Search List. Library and Archives Canada (LAC) is pleased to announce the launch of a new online database, Census of Canada, 1881. Through this online database researchers can access digitized images of original census returns featuring the name, age, country or province of birth, nationality, religion, and occupation of Canada's residents at the time of the 1881 Census. This includes notable figures such as Sir John A. Macdonald, Sir Wilfrid Laurier, Timothy Eaton, and Alexander Graham Bell. The 1881 Census marked the first regularly scheduled collection of national statistics in Canada. Information was collected for Prince Edward Island, Nova Scotia, New Brunswick, Quebec, Ontario, Manitoba, British Columbia and the North-West Territories (which at the time covered much of modern-day Alberta, Saskatchewan, Manitoba, northern Ontario, northern Quebec, Labrador, Yukon, Northwest Territories, and Nunavut). Library and Archives Canada gratefully acknowledges the contribution of Statistics Canada and FamilySearch, without which this project would not have been possible. The index to the 1881 Census was created by FamilySearch. Library and Archives Canada linked the FamilySearch index to the digital images of the original census. 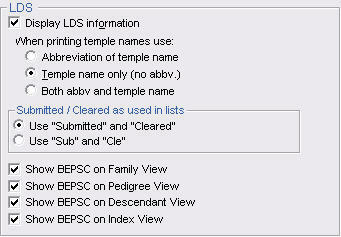 The index and linked images will also be searchable for free through FamilySearch.org. SURPRISE, Arizona, August 7, 2008. Millennia Corporation, publisher of the popular family history software Legacy Family Tree, announced today that it is teaming with Genealogical Publishing Company to provide broader access to popular How-To books. All the rules and "mine fields" for digital imaging. Learn about easier scanning, using sound, digital cameras, video and GPS, making digital scrapbooks, creating hard-bound books, preservation & archiving, and more more. Evidence Explained is the definitive guide to the citation and analysis of historical sources, and the perfect companion to Legacy Family Tree's SourceWriter™. Evidence Explained features over 1,000 citation models, including how to cite digital media: websites, digital books, DVDs, CDs, podcasts and more. Our Legacy Genealogy Cruise to the Baltic Capitals has sadly concluded. 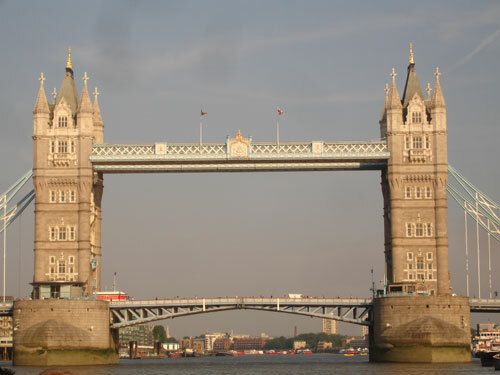 :) I must say it was one of our most successful genealogy cruises ever. 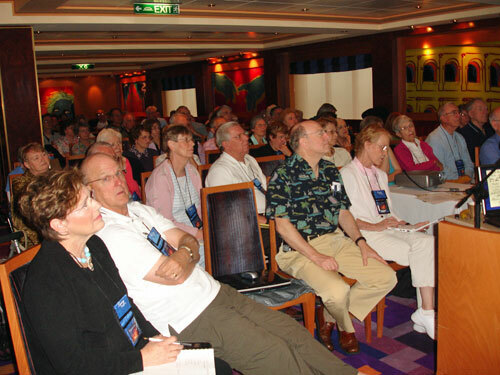 Nearly 200 Legacy cruisers from all over the world attended, and for most, it was the vacation of a lifetime. What more could one want - genealogy, food, history, DearMYRTLE's classes, food, travel, and food (glad I bought those pants with the expandable waist)? While at sea DearMYRTLE and the Legacy staff taught classes and everyone learned something. What a treat it was to have DearMYRTLE teach us about evaluating our sources, blogs and podcasts, locating digital records, and so much more. And despite being thousands of miles from home, she was still able to bring us breaking genealogy news. One of the best parts of the instructional time were the after-the-class breakout sessions where we discussed questions and received suggestions for future Legacy development. 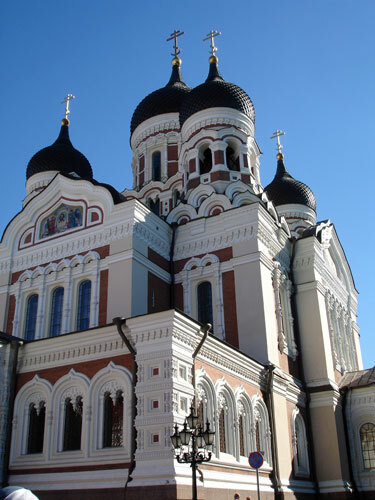 We visited Denmark, Germany, Russia, Finland, Estonia, Sweden, and England. My personal favorite was our day in Denmark where I visited my Rasmussen ancestors' homeland. Thanks to one of our Danish translators, Poul Erik Sørensen, we located the small village and church where my ancestors attended. Luckily the 912-year-old church was open, and I sat where they once sat. 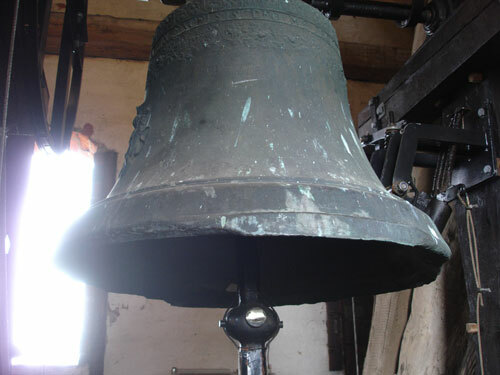 We even got to climb the narrow, spiral staircase of the bell tower. It was an experience I will never forget. Some of us will never forget this experience for other reasons. First of all, nearly all of the cruisers came down with desynchronosis. After about a week we were better, but upon our arrival back home, we once again were plagued with this terrible syndrome--otherwise known as jet lag. DearMYRTLE will now appreciate every future vacation when her luggage actually arrives. We felt really bad for her when after the 2nd and 3rd days she was still without her luggage. Imagine going the entire trip without her luggage. Well, it never arrived. Hopefully now that she's back home it has caught up to her.